This forum is for cars that run, or at least are close to running. This isn't for parting out complete cars. I bought my Toyota Tercel SR5 4WD wagon in 1985. Except for some years when my brother had it, I have been the sole driver from then to now. It's got 277,350 miles on it. I last drove it on-road in September of 2016, after which I parked it off-road. Since then I have periodically started it up to keep the battery charged and check that everything is running ok. I bought it in San Diego and subsequently lived in Tucson and the SF Bay Area (where my brother lives too), all warm areas without winter snows and road salt. There is nevertheless some rust that I describe below. During the years when my brother had it he routinely parked it outdoors in all weather, seldom drove it and never waxed it. Inevitably rust got started due to the neglect. There's rust spots scattered around on the surface of the body. Spots around the windshield are deeper but still appear minor. The most severe rust spot is the right-front edge of the powered sunroof: this would take some minor body work to fix. A body shop guy told me all the rust problems would be easy to repair before doing a new paint job. The driver-side door window routinely slips off track so needs fixing, a straightforward DIY job. The engine runs well. The manual transmission and clutch are good: no problems. Still has original clutch pad, which since it doesn't slip is one indication of how the car was driven over the years. Tires are good. It has alloy wheels. Interior is in good shape. Before it gets back on the road it needs to be smogged: I expect this would require a tuneup. Replaced the radiator myself around 10 years ago. Had auto shop work done on it over the years, and I have all the paperwork for this. Basically I could work on the wagon myself, but I'm just not motivated to do it. I don't have a place where I could work on it out of the weather either. It feel like it's finally time to let it go. Feel free to get in touch to discuss the wagon and a fair price. Last edited by JimK on Tue Apr 03, 2018 4:18 pm, edited 3 times in total. where is it located now? is it in good enough mechanical condition to drive it to another state without issues? can you post pictures of it? Do you have a price in mind? It's in El Cerrito, in the San Francisco bay area. With a tuneup it should pass smog and then be in good enough shape to drive a distance. Not sure I'd feel relaxed driving it cross-country, though I bet it'd make it. I will take pictures and post them on the weekend. I don't have a price in mind. I'm looking forward to seeing what I'm offered. I drove an 83 Tercel 2000 miles from Texas to Vermont 3 weeks ago. It was in rough shape but made it. I had to add little coolant and a quart of oil halfway through the trip. Suckers are tough. Only word of caution is that if anything goes wrong along the way it seems very difficult for garages to find parts. If you are handy you might want to buy them first for the trip. I have driven many new purchases cross country. I bring my tools and a few spares. I figure what ever might leave me stranded: distributor assembly, alternator, fuel pump, some fuel line, spark plug wires, and a few other things. I even roll started a car when the battery went bad and it would not crank, made it home by always filling up at a gas station where there was an incline away from the pumps I stopped at. I have replaced tires, head gaskets, even whole transmission on cross country trips where I bought it in another state and than drove it home. some went better than others, I just plan to leave a few extra days for road side repairs. One car I joked it was going to have all new parts by the time we got home. that one my wife came with me, she was not pleased, but we made it home a day later: new tires, new hoses and belts, new fuel filter, and a swapped out distributor or something similar on the way home for 3000 miles. it is always an adventure. I have a friend that is interested. Sending a pm. 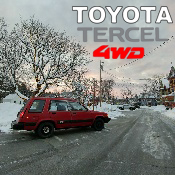 I bought my Toyota Tercel SR5 4WD wagon in 1985. Except for some years when my brother had it, I have been the sole driver from then to now. The engine runs well. The manual transmission and clutch are good: no problems. Tires are good. Interior is in good shape. It has alloy wheels. FYI. I updated the original post with a couple pictures and the mileage. I posted this car for sale back in early April but it didn't sell. Yes, it's high mileage with 277,000 miles. And yes, there's spots of rust on the exterior (not underneath). It was never in a significant accident so there's no bent frame or other collision damage issues. It runs. With a tuneup would pass smog. The interior is in good shape. Has alloy wheels. Good tires. Manual transmission, 4WD and clutch are all in good shape. It's been sitting off-road for a while now. If I don't get it sold soon I'll probably junk it to get it off the property. I'd take any reasonable offer for it. This looks like a great deal guys. If anyone needs a hand with replacing a sunroof or taking this one out to be fixed (there is a water trap in the sill unfortunately (design fault) I have done a lot of work installing them and there is a trick way that is really easy. A few people have contacted me about the Toyota wagon. Much appreciate it. Not surprisingly for such a high-mileage car, the offers so far are on the low side. If you're interested in buying the running wagon please let me know soon. I'll be making up my mind shortly about which offer to accept. Would it be possible to post a lot more, and better, pictures of it, closeups, inside and out, under hood, everywhere. 84 T4 Foxy Blue, 277k, winter driver. 85 T4 Speedy Blue, SR5 + A/C, 296k, summer driver. 84 T4 Curmudgeon Copper, 293k, my first T4 in 1990, now Dad's driver. Sold: 86 T2 silver wagon, VIN ending 5847, 194k, cherry condition, in a good home. RIP - 84 T4 Quicksilver SR5, 125k, blown engine no oil, had sat 10+ years, parted & scrapped. RIP - 80 Corolla (purchased new), 473k, 358k original engine, rear-ended totaled 2003. Sure, I'll take a bunch of photos and post them later this week. This 85 is now saved from the wreckers. Surprisingly, it is in pretty good condition - despite the surface rust. Original owner with records and it worked out great.